If you are interested in enrolling your child in one of our classes or would like to learn more, please call us at 614-794-3298. At our first meeting with parents in 1999, it was asked, "What do you look for in a location?" The answers included:� spacious, convenient, safe, parking, clean facility, something to do while the children are in class, and food nearby for those who dance long hours. Creative Movement, Ballet, Tap, Jazz, Hip Hop. Creative Movement is designed for the new student ages 2 � to 4 years old. All other introductory classes are offered for children ages 5 and above. Exclusive Boys classes are offered in Tap and Hip Hop! We offer an extensive list of classes for students who love to dance for the overall benefit of dance, and want to become skilled dancers. For students who want a more serious level of training, there are the options of Ballet Allonge� or Competitive Training. Our ballet company is geared for the student who loves ballet. Classes are offered multiple times per week and students are offered the opportunity to perform in our annual Christmas Spectacular in excerpts from The Nutcracker in addition to many other performing and training opportunities. Students may train in four levels of competition. This gives those who want to be more involved the opportunity to do it at a level that fits their life and schedule. Students who want to train to become a professional dancer would choose to train at the highest level of competition. I wanted to take a minute to let you know how pleased we continue to be with Generations. There was a noticeable difference between your studio and the others represented at our competitions recently. 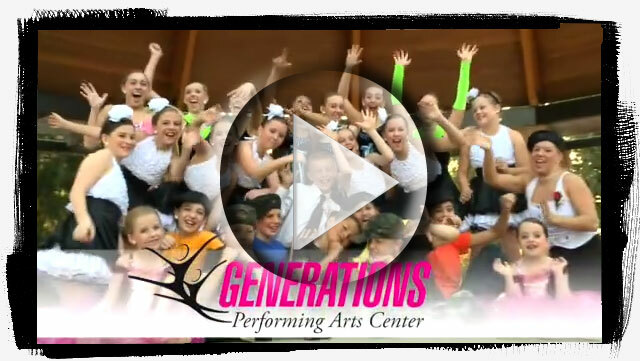 I am very proud to say my daughters dance at Generations. The girls were poised, professional, very well behaved and most of all, well-trained. You, Cindy, and all of the other teachers are going above and beyond in teaching the girls about being a good person as well as a good dancer and that says a lot. I just wanted you to know how much I continue to appreciate what's going on at your studio. I look forward to being able to be more involved in the future. What you are dong is a wonderful thing.